AGE Concern Eastbourne’s Shopping & Leisure Transport service is available Tues, Thurs and Friday on a fortnightly basis when we go to Sainsbury’s at Hampden Park. We are able to take 6-10 passengers per trip. Our volunteer driver is MiDAS qualified and our volunteer passenger assistant is there to help. 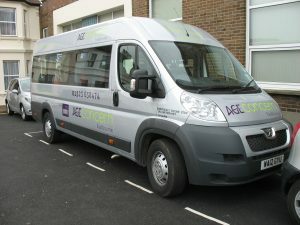 You will be collected from your home and driven to the supermarket in our twelve seater minibus with easy access step and a tail-lift if required. shop. We will then take you home and carry your shopping indoors for you if you wish. This is a sociable, fun and safe way to do your weekly shop. If you would like to organise a shopping trip with up to nine friends or neighbours we’ll be happy to take you to a local supermarket of your choice. 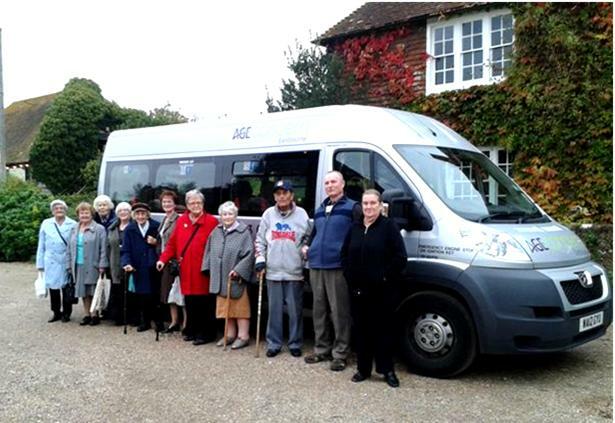 We also run leisure trips throughout the year to destinations such as Middle Farm shop & tea-room, Hilliers garden centre, Michelham Priory and entertainment venues. Please contact reception for a leisure brochure. To join our shopping & leisure trips, please call Reception on 01323 638474.